Pastor John Weaver (Chaplain in Chief of the Sons of Confederate Veterans and pastor of the Freedom Baptist Church of Fitzgerald Georgia) brought us an inspiring message on the Southern virtues of General Robert Edward Lee, the man, the soldier, and most importantly, the Christian leader. Weaver reminded the guests that Lee nobly refused to ever speak ill of his former adversaries. Dixie Guards members and their families brought a fantastic array of salads and desserts to compliment the BBQ pork and chicken, the Brunswick stew and ample fixings made by the camp. The selection of desserts and salads was mouth-watering. Pictured above is a battle-flag cake made by Mrs. Harvey Lively. Surrounding it is pound cake, pecan pie, blueberry cobbler, and banana pudding. Yummm. Commander Randy Crooms (above) welcomed the guests. Behind Crooms is the table display showing local Confederate history. Many attendees were impressed with the collection of local regimental history and profiles of local confederates. 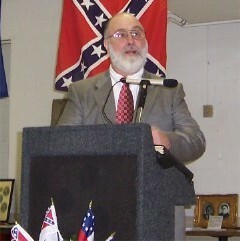 Historian assistant Ted E. Lewis (shown above) displayed local artifacts including pictures of local confederates and a old official battle flag which had been used for previous memorial services. Tony Thompson (left) and Jason West (center) listen with interest as Jason Franklin (right) shares an excerpt from a new book about the capture of President Jefferson Davis. Pastor Weaver is seen (below) posing with some attendees who came in period dress along with Commander Crooms and on the far right Camp Confederate of the Year Carlton Clifton. In the rear people are seen viewing the historical displays. Many guests commented on how much they enjoyed the opportunity to do some talking and fellowship in a "Southern pride" atmosphere. Just under 50 people attended theis year's banquet. That's low by Dixie Guard standards but many commented that it was one of the best banquets they had ever attended. Jay Clifton, Mr. Paradice, Mrs. Paradice, Pastor Weaver, Randy Crooms, Carlton Clifton-winner of award for Most Members Recruited in 2003. Other winners not shown, included Marcus Coursey for Officer of the Year and Carlton Clifton was also named the Confederate of the Year. Tony Thompson won the Dewit Smith Jobe Award. Also not shown was Tattnall Invincibles officer Tommy Wallace who was named as an honorary member of the Dixie Guards at the request of the officers and members of the Dixie Guards. In the spirit of Lee, Jackson and Longstreet, following the banquet the Dixie Guards were able to donate several pounds of bbq, fixings and bread within the Metter community through the Concerted Services Program. Photos courtesy of members Robert and Justin Franklin. Click here for Metter Advertiser article about banquet.